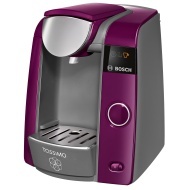 alaTest has collected and analyzed 417 reviews of Bosch Tassimo Joy T43 (TAS4301 / TAS4302 / TAS4303 / TAS4304). The average rating for this product is 4.4/5, compared to an average rating of 4.4/5 for other products in the same category for all reviews. People really like the design and maintenance. The price and performance also get good views, but opinions are divided on the size. We analyzed user and expert ratings, product age and more factors. Compared to other products in the same category the Bosch Tassimo Joy T43 (TAS4301 / TAS4302 / TAS4303 / TAS4304) is awarded an overall alaScore™ of 84/100 = Very good quality. The Tassimo Joy T45 is an affordable capsule coffee maker than can also make other drinks including tea at the touch of a button. But will the espresso it makes satisfy proper coffee lovers? We sent this coffee machine to our Which? labs to find out. Easy to use. Stylish and modern. Love using it with a verity of products. This is an improvement on earlier models, the coffee is hot and tastes much better and smoother, a joy to own. Great product , easy to use and lattes are made in no time at all.\nDefinitely chose the correct product. Happy with it! Some reviewers said that two pods are needed to fill one cup. There's\na way around that, after the first fill has finished hold the button down ,more will come out of it and fill the cup. I hope this doesn't bust the machine. Early days. I bought this for our new red kitchen? it looks fantastic and the drinks are really tasty. Easy to use, no mess and so far pleased ewith the results. The capacino'a seem a little on the small side but maybe I am not using it properly!